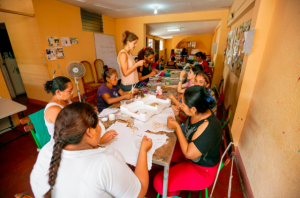 Launched in 2013 by Andrea Paltzer, Chureca Chic empowers women living in the largest Central American landfill through jewelry making. The women at Chureca Chic transform recycled materials from the landfill into unique pieces of jewelry, essentially bringing to life their daunting surroundings. The profits from the company’s jewelry collections are reinvested into its social projects to expand its programs and empower more women. Through its mission and business model, Chureca Chic provides the tools for women like Maricela to feel empowered and in control of their lives. All 19,500 pieces of jewelry offered by Chureca Chic are the products of a process that gives marginalized women a voice.